Author and newsreader Cathy Newman, author of Bloody Brilliant Women: The Pioneers, Revolutionaries and Geniuses Your History Teacher Forgot to Mention, has been announced as the speaker for Humanists UK’s 2019 Rosalind Franklin Lecture on the evening of 7 March in central London. First hosted by Humanists UK in 2016, the Rosalind Franklin Lecture has fully established itself as a key part of the Humanists UK calendar. The lecture is timed to coincide with International Women’s Day, and is named after Rosalind Franklin, the pioneering chemist who was so crucial to the discovery of the unique double helix structure of DNA. 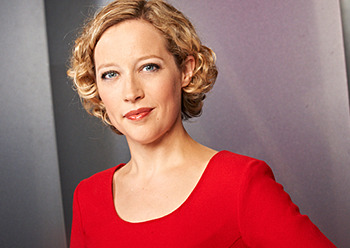 Cathy Newman is one of Channel 4 News’ main studio presenters. She joined Channel 4 News as political correspondent in January 2006 after seven years writing for the Financial Times. She is an award-winning investigative journalist whose scoops have exposed various political scandals and high-profile abuses. She was the only broadcast journalist to travel with Angelina Jolie and the then-Foreign Secretary William Hague to the Congo as part of their campaign against sexual violence. In 2000, Cathy won the prestigious Laurence Stern Fellowship, spending four months following in the footsteps of Woodward and Bernstein at the Washington Post. The paperback edition of her book Bloody Brilliant Women: The Pioneers, Revolutionaries and Geniuses Your History Teacher Forgot to Mention is on sale on 7 March. Tickets cost £15 for the general public and £10 for students. You can get yours at humanists.uk/franklin2019. Held in the week of International Women’s Day, the Rosalind Franklin Lecture explores and celebrates the contribution of women towards the promotion and advancement of humanism – whether through achievements in science, philosophy, or the promotion of democracy and human rights – in the UK and around the world.